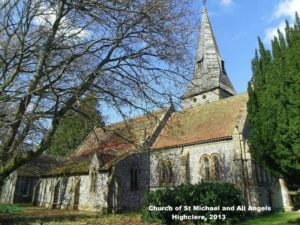 Home » Genealogy articles » Village Booklet – 095 Highclere – is now available. Highclere (VB095) is a long, narrow parish running south from the Berkshire county border just west of the A34. The southern part is on the Hampshire Downs with woodland and parkland covering most of the north. Highclere Park, including Highclere Castle, which is famous for the TV series Downton Abbey, is the well known building in the parish and is the seat of the Earls of Carnarvon. Among the local family names appearing over the years were CRESWICK or CRISWICK, BERRY, EELS or EELES and TAYLER or TAYLOR. This twelve page booklet includes a great deal of historical information covering Highclere including not only the gentry but also the teachers, publicans and ordinary people. To assist with your research, useful references for Highclere documents and records held at the Hampshire Record Office are given throughout, together with other sources and website addresses for more information.